The Museum of Rural Life in Denton has something inside which most small Eastern Shore museums don’t have: a completely reconstructed log cabin. 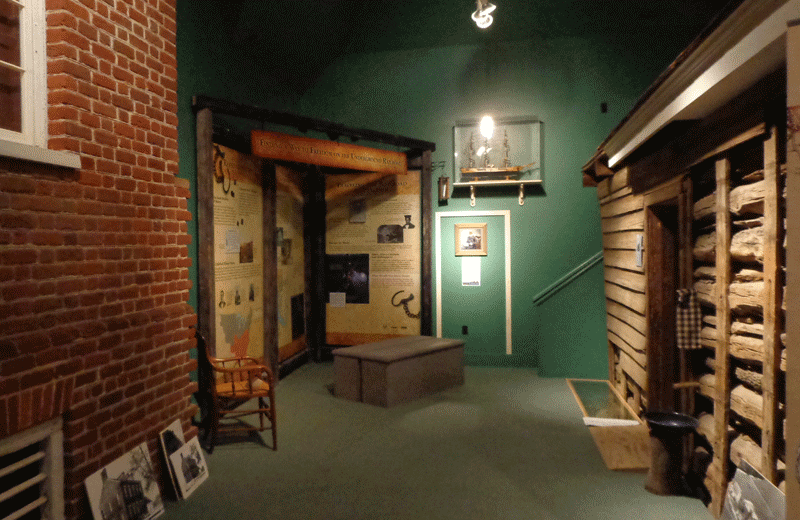 Beyond the tiny Taylor-Brown House at the corner of Second and Gay Streets and inside a deceptively large space, there is a cabin, two other partial houses, plenty of historical artifacts, and a stunning Underground Railroad art exhibit open through August, 2013. The construction of the museum and the conservation of all these historical houses within are due to the diligence of the Caroline County Historical Society and the efforts of native Caroline County resident, champion historian, and my neighbor, Mr. JOK Walsh. 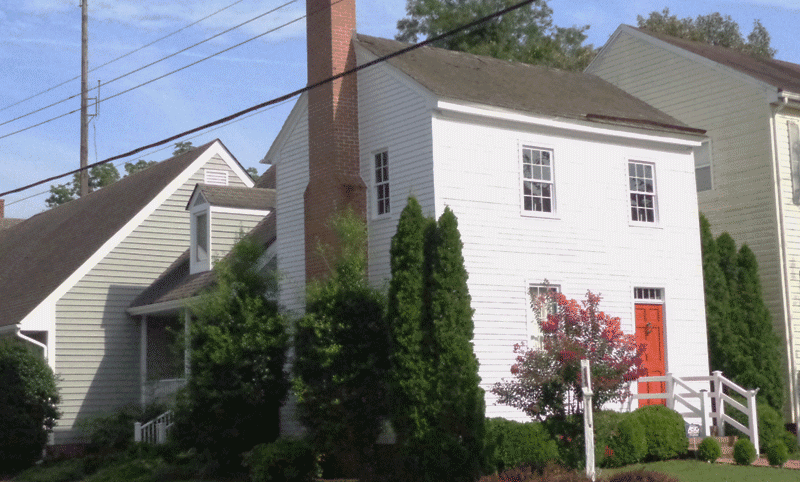 His devotion to the preservation of this county’s history is obsessive and inspiring. Having already been moved by ‘mule cart’ twice, the Taylor-Brown house, circa 1819, was once owned by the African American Taylor family and was moved to its present location in the 1980’s by Mr. Walsh as a cornerstone for the museum. This 200 plus year old house requires regular leakage attention but you can see the happy wear of the foot traffic from the bottom of the stairs and feel the claustrophobia in the tiny rooms. Mr. Walsh lives two houses up from the museum and I can see it out my kitchen window. As a neighbor, I have been regaled with many a story. 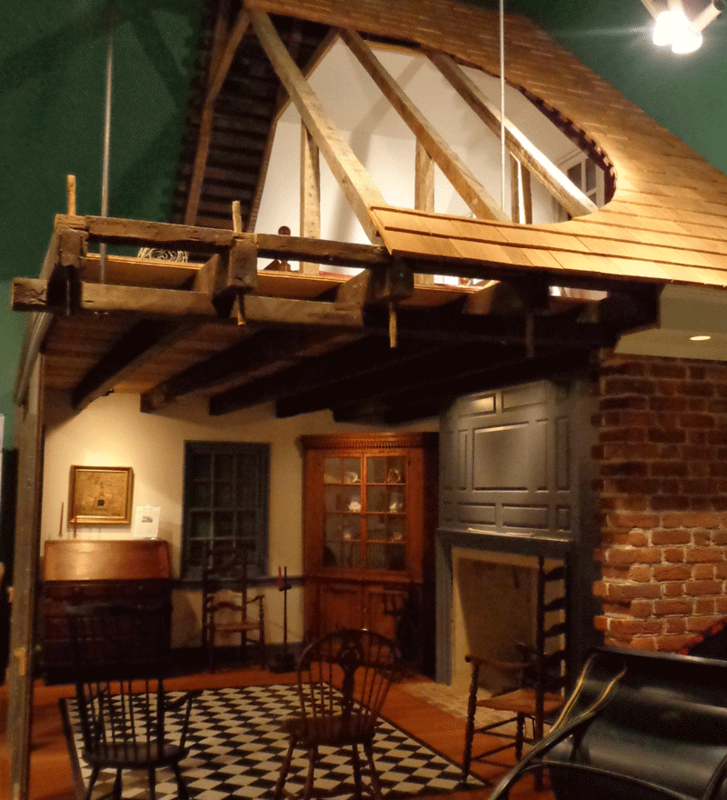 He had the crazy idea to rebuild the log cabin, Painter’s Range circa 1824, inside the museum. Or was it the museum around the cabin. My favorite story was his discovery that the name written on the back of the cabin’s door was in fact the original owner‘s as substantiated by the land record research of Miss Pat Guida. You have never seen two geeky people more excited. When you walk into the cabin, you walk into a different century and it smells musty and dusty and smoky. This is the shelter for a hard working and humble person. The house is made from the land and would have returned to it had it not been saved. You can climb a set of stairs on the outside and view the hot small sleeping loft as well. Skillington’s Right, circa 1795, is the fully rebuilt brick facade of an upper class house. And Chance’s Desire, circa 1787, is the home of a “middling planter” with a parlor room and a bedroom above. But my favorite exhibit will always be the cabin. Check the back of the door for the name on your way out. As it has enjoyed three centuries with an agro-based economy, one half of Caroline County’s history is tied to the industry of farming including canning and chickens. 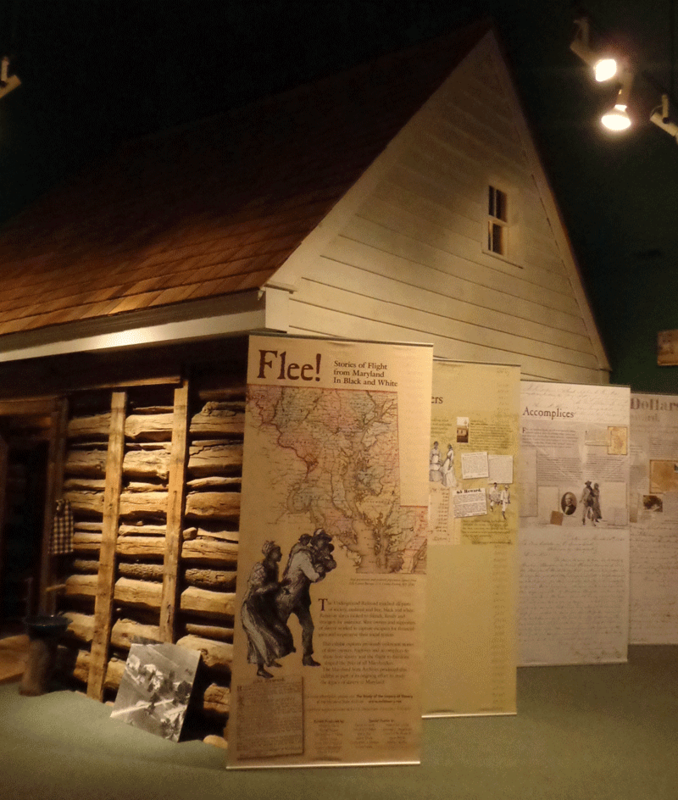 The other half of the museum’s focus is based on the county’s location of being slam in the middle of the pathway of the Underground Railroad, the route northward to freedom for American slaves. At some point, Both Harriet Tubbman and Frederick Douglas lived near here and traveled by the Choptank River which is right down the hill from here. There are large nice museum quality display boards narrating and fleshing out these incredible journeys through Caroline County towards their eventual freedom. Funny how we seem to willingly forget this chapter of American history, but with hope is a still a nicer way to remember. Additional and assorted artifacts to see include a huge gilded mirror from the Two Johns Estate, once in a town southward called Harmony. To my surprise, in a side room, I found an actual whipping post. 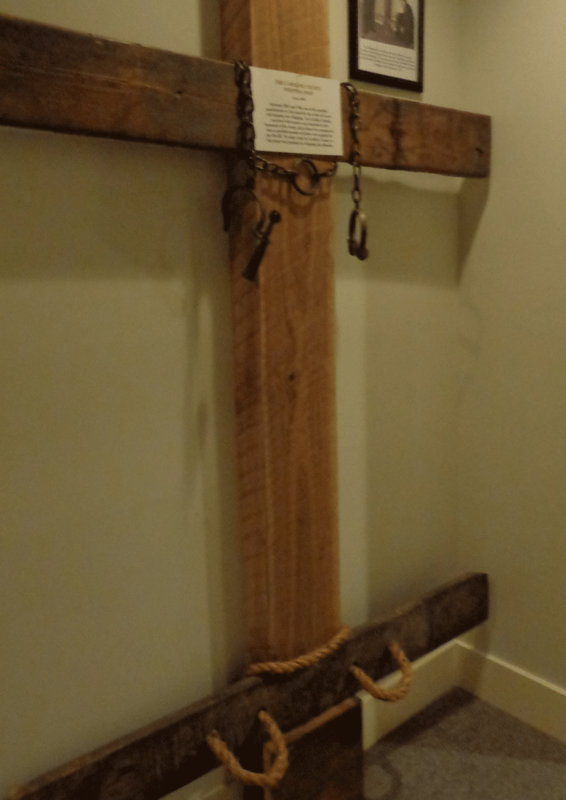 The note card attached to this jarring piece claims it came from the basement of the courthouse circa 1916, but says it was used to whip wife beaters, supposedly the only crime punishable by this method. Interesting reading but I can not help but thinking there are missing facts here. My only disappointment was to discover that Lady Egglentine, previously at home in this room too, had been chicken-napped to a Greensboro museum nearer to her original home. In 1915, almost one hundred years ago, she made the Guinness Book of World Records for laying 314 eggs. There was much fanfare. She’s probably looking a little rough around her taxidermied edges by now. 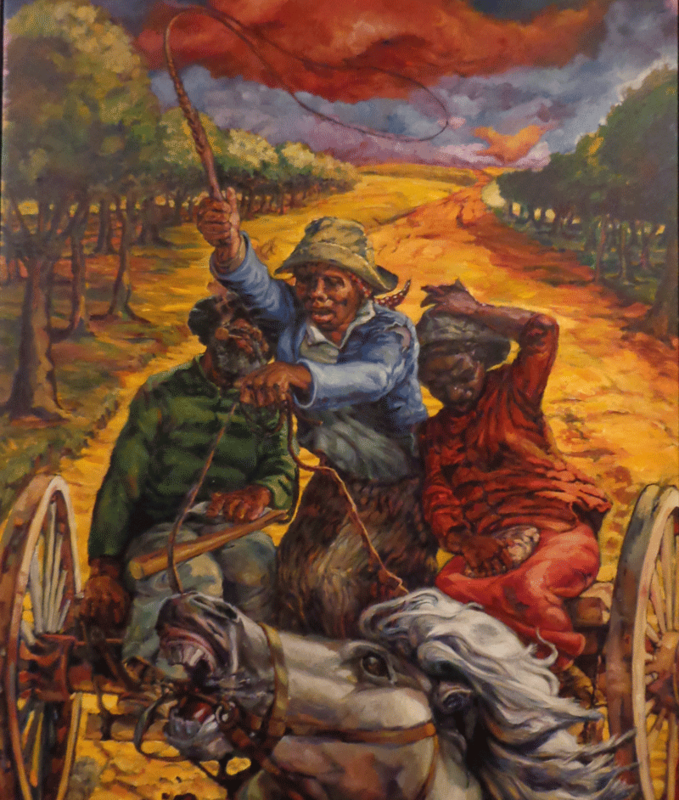 And if you are lucky enough to visit the Museum of Rural Life before August 31, 2013, you will get to witness artist’s Mark Priest’s amazing, vibrant, and enthralling painted depictions of the Underground Railroad. Most of the pieces are acrylic on large canvases and the tension of these journeys is conveyed through the colors and action of the scenes and the anguish of the people’s faces. His art is well worth a hurry-up to see. The front of the information card for the Museum of Rural Life advertises “more than 300 years of stories and structures“. And adds, “History is much more than a series of dates and facts. How people lived, where they lived and the choices they made often tell much more about who they were than mere numbers on a page.” And thanks to the undying passion of the Caroline Historical Society, you will not be disappointed with a visit to Denton’s Rural Life Museum. It’s large enough to contain 4 houses but the history inside is bigger than the sum of it’s parts.